The first-ever Tibetan Entrepreneur’s Game Changers Conference, organised by Tibetan Entrepreneurship Development (TED), an initiative of the Department of Finance is currently underway at Nyatri Hall, Gangchen Kyishong. Over a hundred Tibetan entrepreneurs and budding businessmen including web designers, fast food makers, organic product traders, mobile app designers, etc. are participating in the two-day conference. Sikyong Dr. Lobsang Sangay accompanied by fellow m embers of the 14th Kashag inaugurated the conference this morning. In his inaugural address, Sikyong Dr. Lobsang Sangay underlined the importance of the role played by entrepreneurs in the economic development of a community. He added that in the Tibetan context, entrepreneurship is even imperative due to the political status of the Tibetan people as refugees, which makes survival even more demanding. At the same time, Sikyong appreciated the fact that Tibetans are hard working and more enterprising as compared to their neighbors in the Tibetan settlements, as proven by a data collected by a private researcher recently. The data revealed that in a typical Tibetan family, both the father and the mother go for work, which results in double income sources as compared to others, where the father is the sole breadwinner. Sikyong also called for more such conferences and workshops in future to expand the Tibetan entrepreneurial network and effectively amplify the Tibetan entrepreneurial spirit by fostering, nurturing and enriching entrepreneurial knowledge. Finance Kalon Mr. Tsering Dhundup, in his address, said that entrepreneurship is key to sustaining the economic viability of a country. He talked about the growth of Tibetan economy since 1959 under the visionary guidance of His Holiness the Dalai Lama and the efforts of the Tibetan cooperative societies. The two-day GameChangers conference, in line with the objectives of TED, is aimed at creating an annual platform for collaboration, innovation and networking between Tibetan Entrepreneurs and the world. 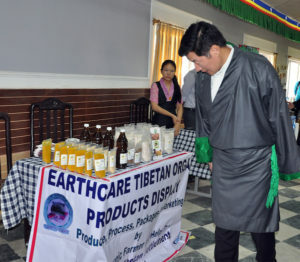 It enables Tibetan entrepreneurs to build networks, enrich knowledge, and connect mentors and investors to pitch their business ideas on the given platform. The conference was initiated after analyzing the current needs of the nascent Tibetan entrepreneurship ecosystem to ensure a profound transformation from the current business culture within the Tibetan community towards a system at par with mainstream entrepreneurs at national and global level.